Albeit not impatient by nature, there comes a point where I have to admit I'm participating in something for a given reason. This notion struck me as I was watching King Kong over the holidays while back in Providence visiting my family. Yes, the movie was stunning and included all the drama and emotion that Peter Jackson wanted to instill in this, his pet project of the last few years, and the effort carried over extremely well. In the back of one's mind, however, was the larger question: When would we see the silver-backed tragic hero at his combative peak? Plus, while these moments were everything you could have hoped for, one had to admit they were a large part of the reason you shelled out several dollars for the ticket in the first place. The same logic applies to Doom 3 and the Last Man Standing modification, available for free as a free 156 megabyte download via the folks at filefront.com. 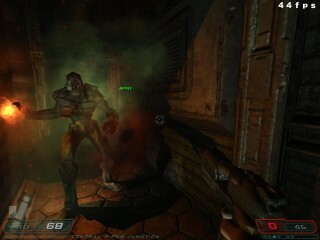 While Doom 3 pulled players back into the series with a state of the art game engine and top notch graphics, the fact that the title succeeded in establishing a mood and a solid story made things all the more interesting to its player base. This may not have been the exact reason they bought the game, but it was nice to find this packaged along with the title as well. Down and dirty survival action in the Last Man Standing mod for Doom 3. Last Man Standing strips away all pretense of story and ladles on what most of us could ever want out of Doom 3: a thrilling, tense, almost-hopeless first person shooter experience against hordes of enemies in the classic Doom style/space marine environment which any fan of the series can love at first sight. Simple, fun and to the point, Last Man Standing places the player in the position of choosing a level and needing to eventually escape from a given area while opening and sealing doors behind them, all while fighting near-endless waves of enemies with any weapon at hand. Escape to a new room and the experience changes as the player waits for the next wave to arrive from an unknown location. Include multiplayer cooperative play, as has been done for this mod, and the game gets even better. Players can easily start or join servers, configure a character and drop their unit in to help against overwhelming numbers. Where once hopeless odds meant a player had to hit and run, a squad of four to six players can begin to use advanced tactics such as defending zones, guarding ammunition and health pack respawn points, focus heavier fire, combine different weapons and cover each other while reloading. Last Man Standing provides an arcade feel throughout the experience, especially with slain units being forced to play through from the beginning of a room after dying. It's almost as if the player had been killed, thrown in an additional quarter and elected to continue at a designated save point. While not the most groundbreaking modification ever to be made to a game, Last Man Standing is quick, cathartic, and clever in its play style, and a great way to kill a spare 20 minutes. The authors may not have been looking to define pi through their efforts, but created something incredibly fun that's worth the download. Last Man Standing requires a full version of Doom 3 and 168 megabytes of disk space to run. The application features a Mac OS X-native installer, which can be launched via a built-in AppleScript. While this isn't as convenient as a clickable icon, the program's Read Me file covers the basics and allows for players to quickly click open a pre-configured AppleScript which can then be run (the AppleScript can be easily added to the Dock menu) to launch the game. Only one major bug seems to stand in the way of the mod working perfectly on the Mac. The program, when quit, continually experienced problems shutting its files down and provided a screen that asked the user to click the "Close" button, which worked every time. Not the worst bug in the world and every version of Yahoo Messenger I've used on my dual G5 have done the same thing. That aside, the program runs as cleanly as the user could ask. Doom 3, which retails for $44.99 through Amazon.com, is perhaps the most hardware-intensive game currently available for the Mac. It requires Mac OS X 10.3.8 or later, a 1.5 GHz or faster G4 or G5 processor, 512 megabytes of RAM, 2.0 gigabytes of free disk space, a DVD-ROM drive and graphics card with at least 64 megabytes of VRAM. Not for the faint of heart, the hardware requirements are steep and aren't forgiving for those attempting to fake the bare minimum. It's a force of nature, and no amount of kvetching (albeit impassioned and well intended) is going to make it go away: Your laptop battery is going to lose its ability to retain a full charge. Not pleasant news in the least (especially given the trio of autographs I have for my iBook's current battery - Steve Wozniak, John Draper and Kevin Mitnick), but these are the facts of life and they must be reconciled. Nothing lasts forever and we've all woken up to find our pet goldfish doing the backstroke. CoconutBattery provides additional information as to your laptop battery's overall life span. Although Mac OS X allows for a good deal of battery conservation and energy management, it's still a guessing game as to exactly how much life is left in a battery and what to expect of it in the future. The answer to this problem may have arrived in coconutBattery, a freeware application and Widget designed to display exactly how much of a full charge an iBook or PowerBook's battery is able to retain as well as other useful information such as the age of the Mac, a better readout of remaining battery life, battery loadcycles and the ability to save and compare reports as to battery capacity for future reference. By no means critical, but a good idea nonetheless, coconutBattery goes a few steps beyond what Apple has built in for feedback and packages a fair amount of technical information into a format that can be understood at a quick glance. 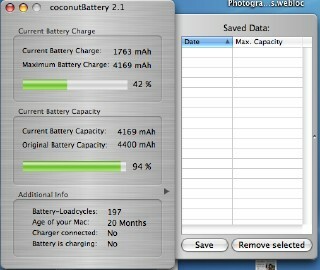 CoconutBattery is available for free through coconut-flavour.com and requires Mac OS X 10.4 to run. The program's Widget version installs cleanly and as expected through Tiger's current Widget management program (which asks if you'd like to keep or delete the application) and provides the basics of the full program in the form of overall capacity, age of the Mac and current loadcycles. The program is developed by Christoph Sinai, a 22-year-old student living in Germany, who asks for a Paypal donation if you like his work. That wraps it up for this week. As always, if you see something new or cool in the Mac universe, let me know. In other news, I'll be attending my first San Francisco Macworld Expo next week with the TMO group. If you have something on the tip of your brain that I should look into, please tap me on the shoulder and let me know. 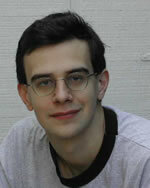 Chris Barylick covers games for The Mac Observer, and has written for Inside Mac Games, MacGamer, and other publications. Guest Posts Hidden. View Them. You cannot edit your comments. You cannot delete your comments. You are not logged in, and this post will appear as "Guest." Log in with your username and password from the TMO forums. If you do not have a username, you can register here. Please note that guests are limited to including a maximum of two URLs per post. Other World Computing: Upgrade with high speed SATA Drives! Up to 500GB SATA HDs in stock from $59.99. Plug and Play HD upgrade for iMac G5 and PowerMac G5 - or add more drives with a SATA PCI Controller to any PowerMac G4 or G5 model! � The Mac Observer -- All information presented on this site is copyrighted by The Mac Observer except where otherwise noted. No portion of this site may be copied without express written consent. Other sites are invited to link to any aspect of this site provided that all content is presented in its original form and is not placed within another frame. The Mac Observer is an independent publication and has not been authorized, sponsored, or otherwise approved by Apple Computer, Inc.